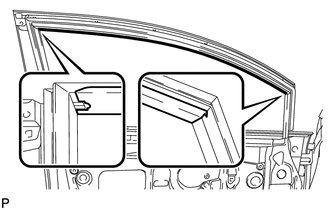 (a) Using a clip remover, disengage the 2 clips and remove the upper part of the front door weatherstrip to the extent that allows removal of the front door stripe and black out tape. 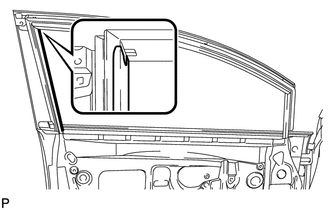 (a) Using a heat light, heat the front door stripe and vehicle body. 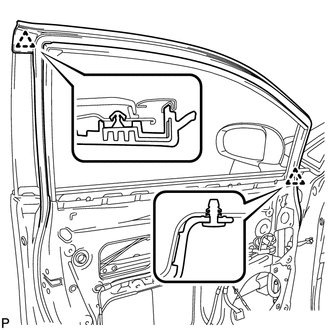 Do not heat the vehicle body excessively. (b) Pull back on one of the ends of the front door stripe to remove it. When pulling on the tape, pull it parallel to the body. 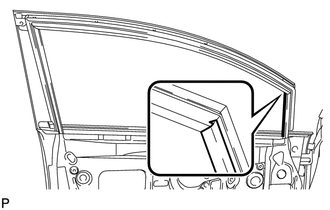 (a) Using a heat light, heat the front door lower outside stripe and vehicle body. (b) Pull back on one of the ends of the front door lower outside stripe to remove it. (a) Using a heat light, heat the No. 1 black out tape and vehicle body. (b) Pull back on one of the ends of the No. 1 black out tape to remove it.